We’re only a few weeks away from Spring Break. If you don’t have plans, no worries it’s not too late – Two Sisters Travel has plenty of ideas for all vacation styles & budgets. When you book with them you don’t have to worry. They handle all of the details and their travel planning services are complimentary. Two Sisters Travel Top Spring Break Vacation picks for 2016. 1. Family-Friendly, All-Inclusive Resort. After winter, warm up in the Caribbean or Mexico at an Azul or Beaches all-inclusive resort. This is truly a vacation for everyone in the family with gourmet food, entertainment, activities and even waterparks. Get an all-inclusive vacation quote here. 2. Disney Cruise. Can’t get away for an entire week? Try a 3 or 4 night cruise on the Disney Dream. This ship was refurbished just a few months ago with a new adult pool feature, Satellite Falls, where you can relax while your kids enjoy their new Star Wars and Disney Infinity-themed youth/children areas. Wreck-It-Ralph’s favorite sweetheart, Vanellope, has her own sweet shop opening, too. Get a no-obligation quote now here. 3. Explore New York City. Instead of going South, go north to the city that never sleeps. Stroll Central Park and take in a Broadway show like Aladdin, Wicked or The Lion King with your family, or visit world-famous museums and monuments. Get a free no-obligation quote here. 4. New Frozen & Star Wars Attractions at Walt Disney World. If it’s been a while since you’ve visited Disney or planning a first time visit this spring you can enjoy lots of new attractions in the parks. Frozen Ever After will be opening in the Norway Pavilion at EPCOT. For the Star Wars fans, check out the new Star Wars Launch Bay at Hollywood Studios where you can meet your favorite characters, including Darth Vader & Chewie. Don’t miss the Hyperspace Mountain in side Magic Kingdom. Get a quote free no-obligation quote here. 5. Florida Keys. Don’t have time to get passports in order? Visit a tropical paradise right here in the U.S. with a trip to the Florida Keys. Plenty of family-friendly activities including water sports, dolphin encounters, nature walks and plenty of history and beauty. A family-friendly favorites is the Hawks Cay Resort on Duck Cay. Get a free no-obligation quote here. 6. Universal Studios Orlando. Have a Harry Potter fan in your house? 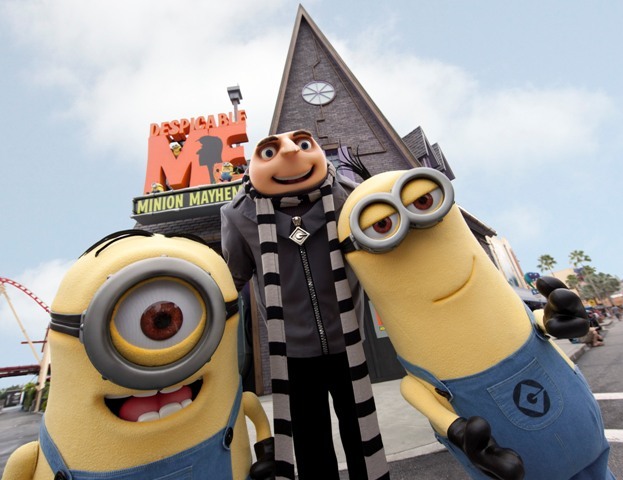 Are your kids dying to meet the Minions? Surprise them with a trip to Universal Studios, where they can tour Diagon Alley, actually meet and dine with their favorite Minions, and even meet dinosaurs and Transformers. It’s not too late. Take advantage of great deals too with “3rd day free” offer and up to 30% off your resort stay. Get a free no-obligation quote here. If any of these vacations sound perfect for your family, get a no-obligation quote online and start planning. Or if you have something else in mind for your spring break trip call Two Sisters Travel at 843-284-3241 and they’ll be glad to help customize the perfect getaway for your family. Their concierge vacation planning services are always free. This entry was posted on Tuesday, February 9th, 2016 at 12:05 am	and is filed under Disney deals, Travel/Weekend Outings. You can follow any responses to this entry through the RSS 2.0 feed. Both comments and pings are currently closed.